Equimania! is returning to the Can-Am All Breeds Equine Emporium March 19-21, London, ON. 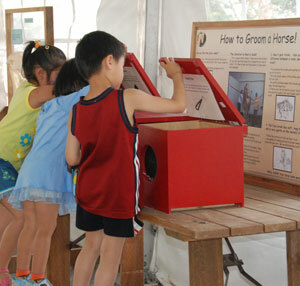 Remember to visit EquiMania!’s Education Centre – the interactive youth education program promoting horse health & safety featuring “Play Safe. It’s HorseSense!”. Friday, March 19 (3 to 4pm) Gayle Ecker, Director, Equine Guelph, presenting “The Horse Health Check: An Important Tool for the Horse Owner”. Saturday, March 20 (3 to 4pm) Dr. Jeff Thomason, U of G (Biomedical Sciences) Anatomy professor and hoof researcher presenting "Why Have a Hoof?" This talk will give an interesting functional anatomical tour of the equine hoof with a special update of the research program studying interaction of the hoof and the ground/track. Sunday, March 21 (3 to 4pm) Dr. Susan Raymond, Equine Guelph, presenting "Environmental Stewardship for Horse Owners, reducing your carbon hoofprint". Are you an environmentally friendly horse owner? This presentation will present a plan to help you "reduce your carbon hoofprint"!